Got your attention with that title, didn’t I? 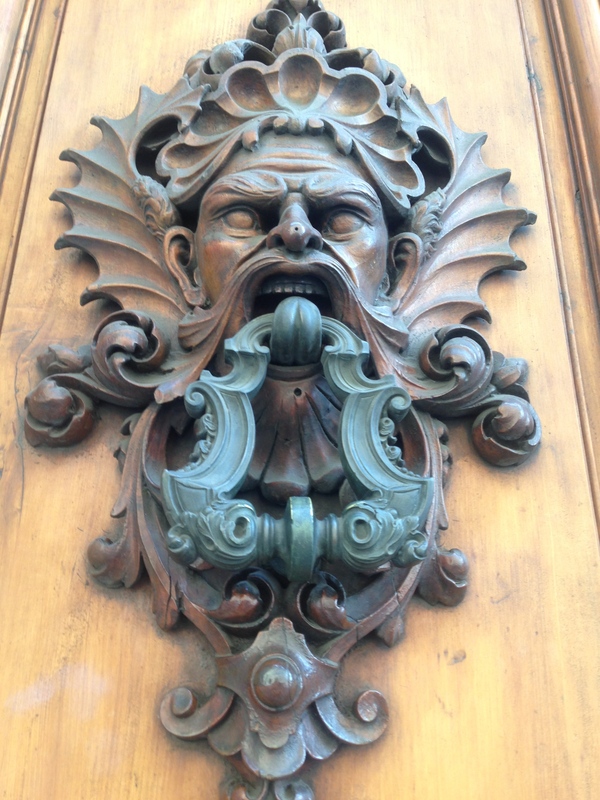 Last week I traipsed about Italy and France with my dear husband. The art was overwhelming. As it always is. But the art I enjoyed most were pieces that peeked from shadowed alleys and appeared when I least expected them, lost down a cobblestoned arm of the beast that is Venice’s pathways. I found them in Vatican City, Rome, Florence, and Paris too. 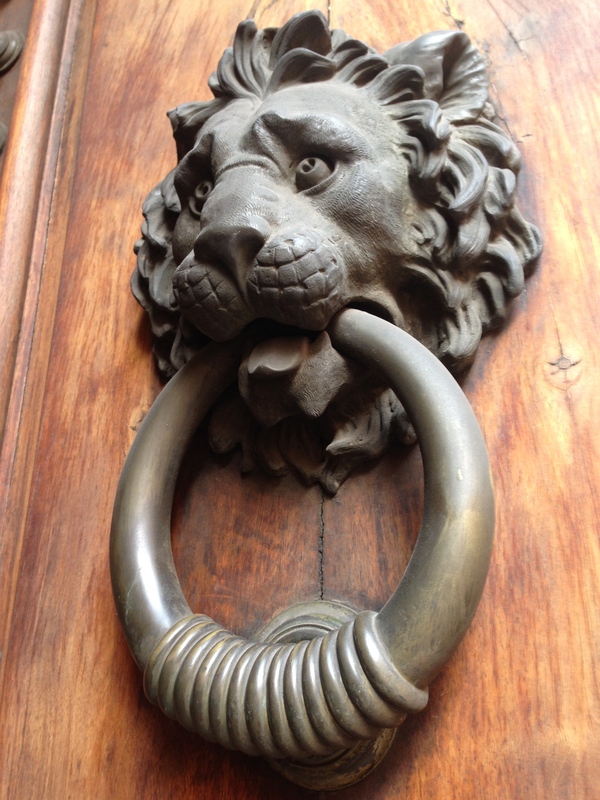 I’m talking about door knockers. Mythological references. Beautiful faces. Flora and fauna. Whimsy. 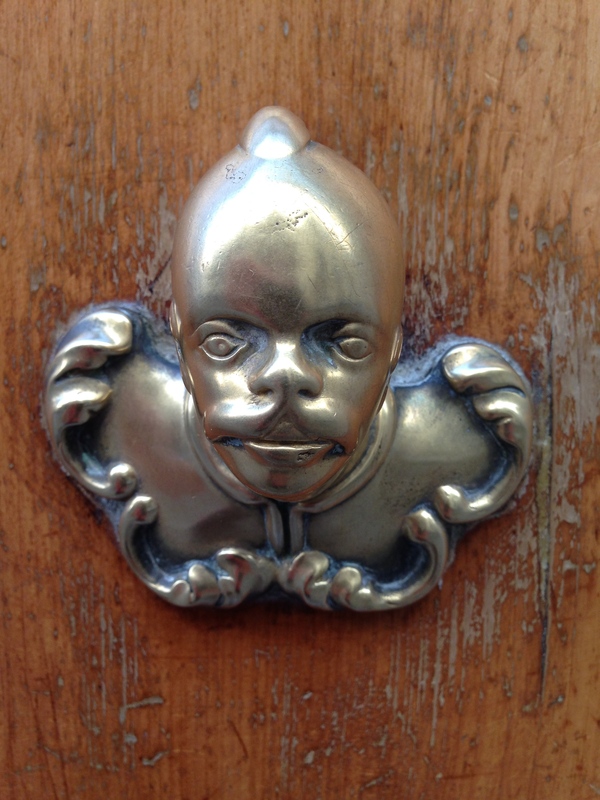 The brass entry pieces hint at the personalities of individuals who first lived in the townhomes, apartments, and houses of these old cities. Here are a few that show evidence of nature. 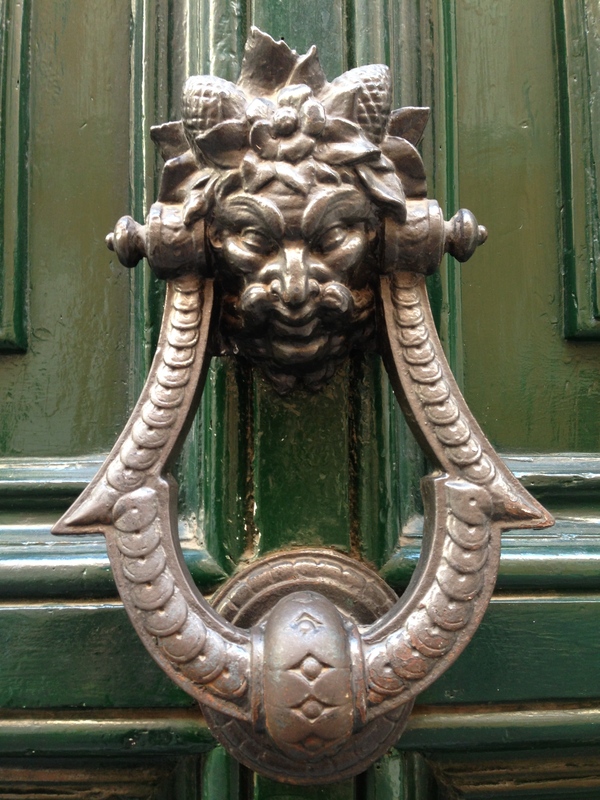 They are derivatives of the mythological Green Man, a face, usually of leaves, that represents the earth, spring, or renewal. The first shows pine cones, which, because of their perfect Fibonacci sequence layout, symbolize enlightenment. (There’s a big one in the Vatican that they supposedly nabbed from the top of the Pantheon. Not sure if that’s been confirmed. There’s also a pine cone on the Pope’s staff.) You can also see leaves and maybe a flower shooting from the first guy’s noggin. He is nature. 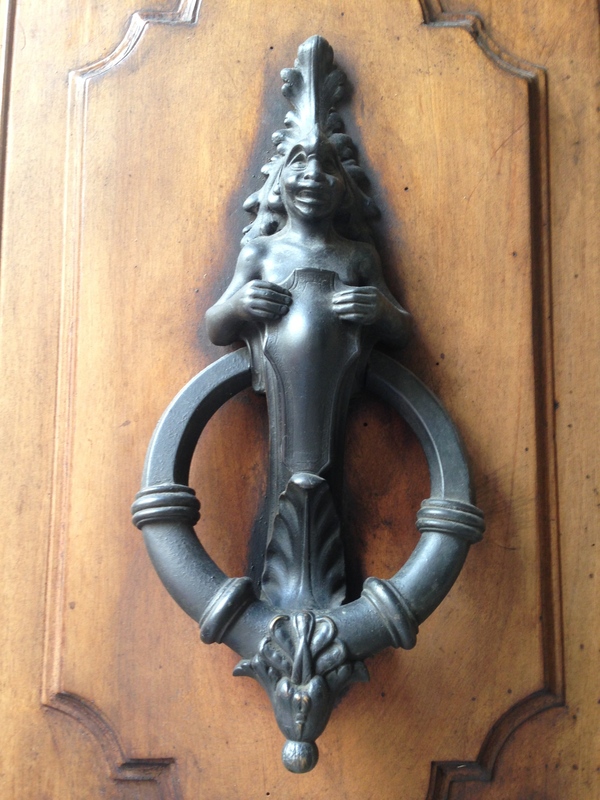 The second knocker is more ocean themed. He has gills at the sides of his face, a shell adorning his head, and his mustache appears to scroll out and become waves. He is the sea. The third also references nature in the leaves sprouting from the small person’s head. Don’t you love the look on his little face? All of these are meant to remind us of our connection to the earth and the ocean. 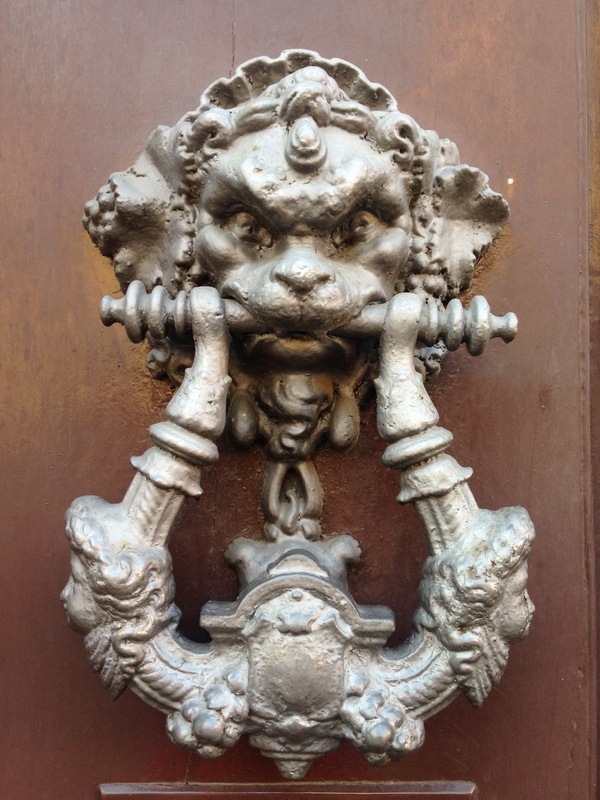 The first one below shows a satyr of sorts with a cheeky grin. Look at the detail in his beard and the fabric draped around his neck and shoulders. 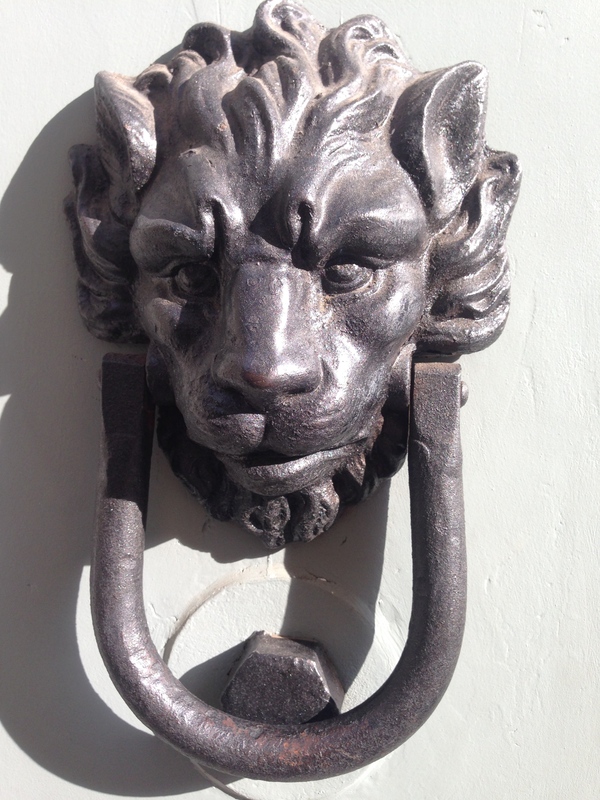 His neighbor is a more traditional-looking knocker, but it reminded me of a torc. 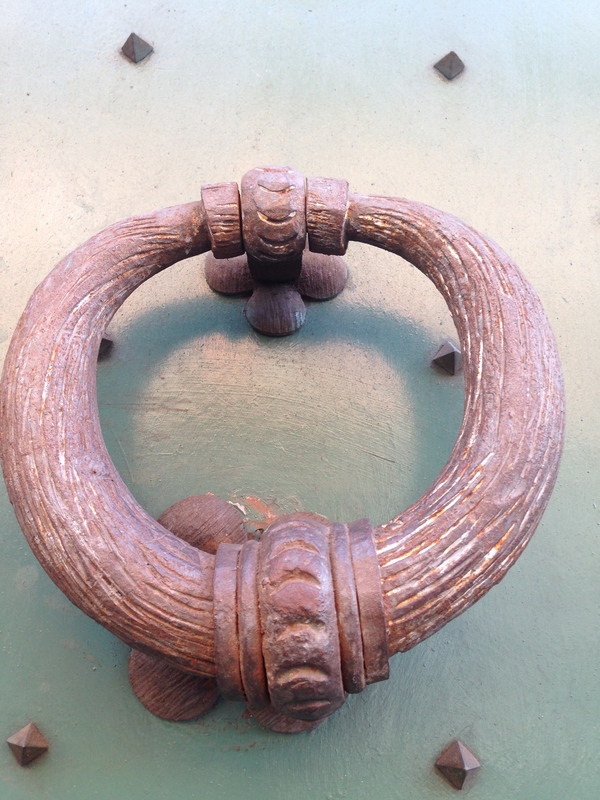 A torc was jewelry worn around the neck or as a bracelet, and some were very important to the wearer. The bronze, gold, silver, or copper piece was reputed to give its wearer power in battle, amongst other things. These four feature what I believe are lions. Lions are featured regularly in heraldry. (Some would argue many lions in heraldry are meant to be leopards, but that is an entirely different subject.) 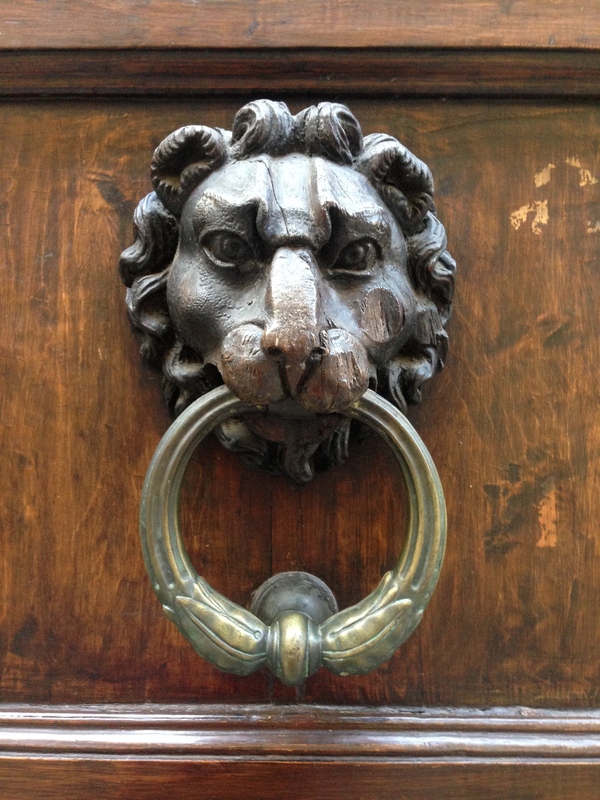 The beast represented nobility, courage, strength, and the unwillingness to attack unless provoked. Handsome fellas, aren’t they? The man below stumps me. 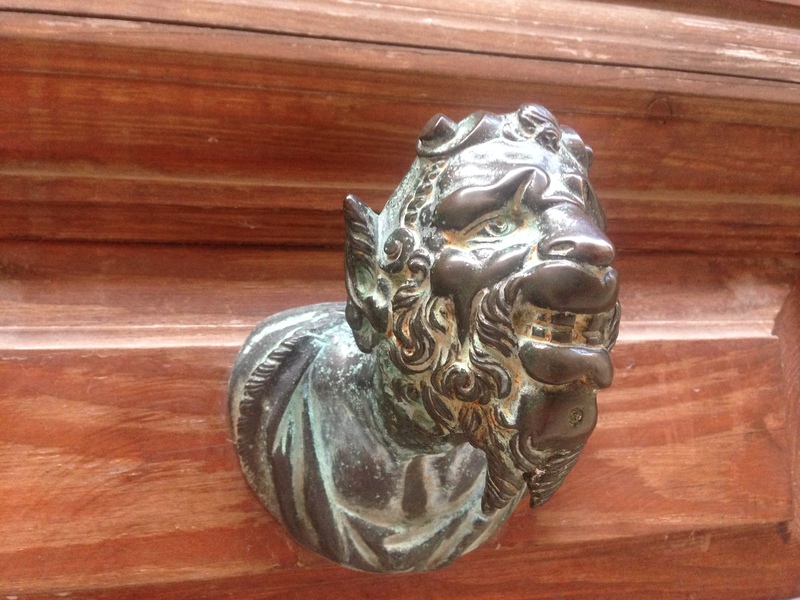 With his quirky bald head and googly eyes, I’m not sure if he is meant to be someone who actually lived in Venice (that’s where I found more than half of these) or simply a fun fellow to grin at when you get home from rowing your boat around. The woman may be the representation of a goddess or simply a beautiful lady. Her hair tie boasts leaves and grapes, indicating fertility. 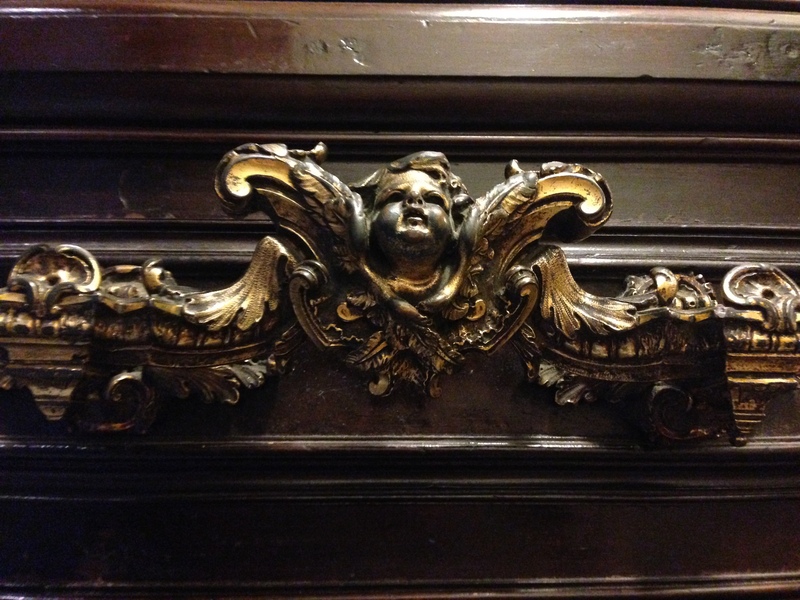 The angelic piece at the bottom is from the door leading out of the cupola stairs in St. Peter’s. It’s always interesting to see the blend of Pagan and Christian. This looks like Cupid, Venus’s son, if I’m not mistaken, and here he is looking solemn and ready for prayer in the most famous holy place in Christendom. I love his detailed features and the contrast between his youthful cheeks and his serious eyes. Which one is your favorite? And if anyone who stumbles across this blog knows more than I do about these, please correct me and/or share your thoughts. I love to learn! 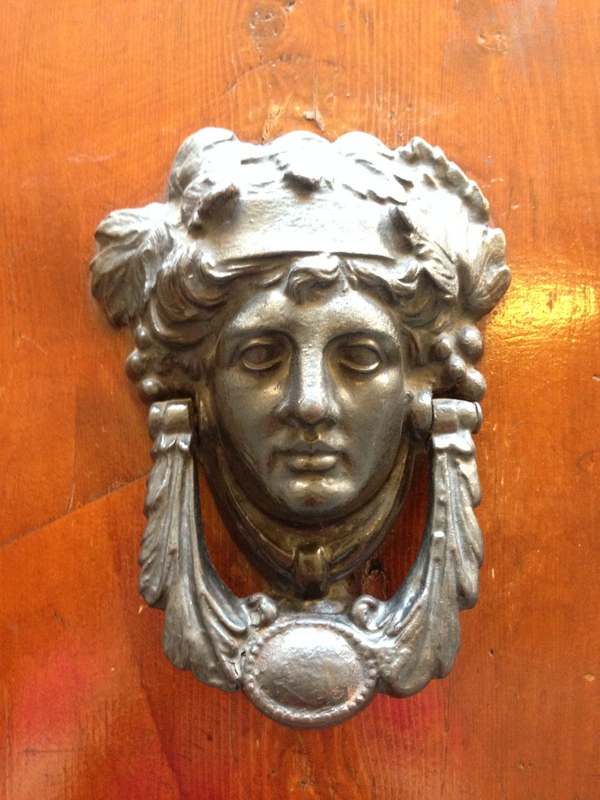 This entry was posted in travel and tagged art, bronze, door knockers, Florence, Paris, Rome, symbolism, Venice. Bookmark the permalink.